At the age of 27, Jimmy Sansone describes himself as a lifetime entrepreneur, a guy who’s always taken pride in the clothes he’s worn, and an unabashed cheerleader for the Midwest. It’s only natural, he says, that those attributes have co-mingled to form the basis of his new company – The Normal Brand, which designs and produces a clothing line aimed at Midwestern consumers. And his love for the Midwest? And thus was born The Normal Brand. Sansone says a couple of things separate his line of clothing from others. Sansone says that versatility, and durability, and an emphasis on comfort are hallmarks of The Normal Brand. The Normal Brand’s fall line includes henleys, sweatshirts, hats and T-shirts, mostly for men, he says. But the popularity of the brand prompted Sansone to offer a selection of women’s styles too. Manufacturing is done with the Star Design Group in the Soulard neighborhood of St. Louis. Sansone launched the company is March, with expectations of $70,000 worth of sales this year. But the brand has taken off, with sales now estimated to reach a half million dollars for 2015. This month, The Normal Brand was awarded a prestigious Arch Grant. Sansone says the $50,000 grant will go toward continued product development. “What’s really been rewarding is the emails I get every day from customers saying they are proud to wear The Normal Brand and to keep doing what we are doing,” says Sansone. 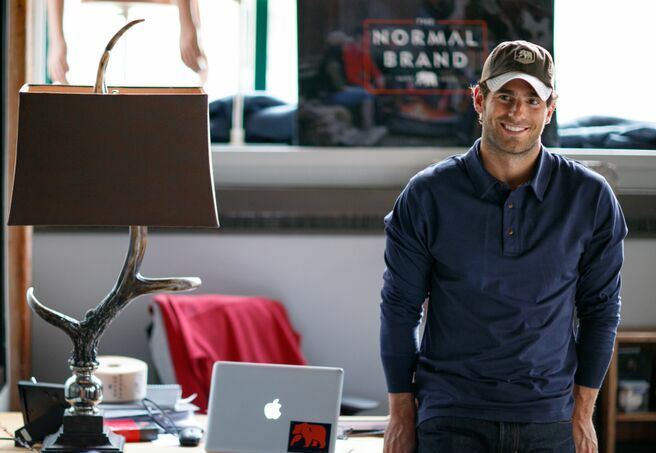 The Normal Brand line of clothing is available online at thenormalbrand.com and at 75 retail stores across the country, including eight in St. Louis. Fun in the Sun in Kirkwood and Chesterfield, Woody’s in Frontenac, Crescent Coast in Clayton, and a shop in the Scottrade Center downtown are among the places customers can find The Normal Brand in the St. Louis area. And how will they be able to spot the brand? Just look for its distinctive logo – a stylized bear, adapted from the image of a bear that appears on the state flag of Missouri. “If you read conservation reports,” says Sansone, “there’s a bit of a resurgence of the bear in the Midwest. And the region as a whole is resurgent, with startup communities in places like St. Louis, Kansas City, and Columbus.